This data set provides two data files in text format (.txt). 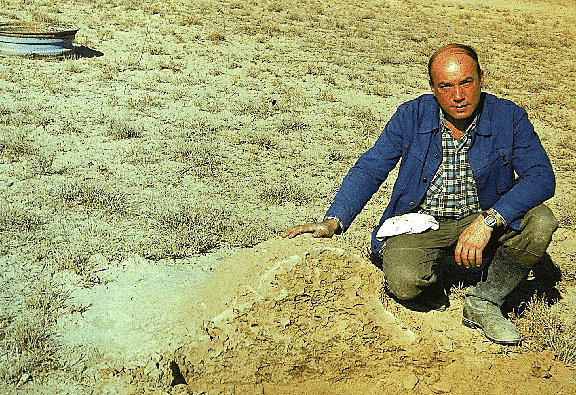 One file contains a long time series of biomass measurements made between 1955 and 1989 on a semi-desert steppe at the Dzhanybek Research Station in Kazakhstan. The second file contains monthly and annual climate data for the study site for the period 1953-1989. Peak live biomass measurements were made from 1955 to 1989 (excluding 1976) and additional measurements of above-ground live biomass and dead matter were made seasonally from 1985 to 1989. Averaged over the time series, above-ground live phytomass and standing dead were estimated to be 137 g/m2 and 32 g/m2 (dry matter weight), respectively, while below-ground phytomass dry weight was 1,750 g/m2. ANPP was estimated to be 201 g/m2/yr. BNPP and TNPP were not estimated. The study site is one of eight major grassland types of Eurasia which encompass an extremely wide climatic gradient in the direction of increasing maximum summer temperatures and continentality and decreasing precipitation in a north-west to the south-east band of steppes in the European and Asian parts of the former USSR (Commonwealth of Independent States). Dzhanybek, on heavy light-chestnut soil, is a continental steppe with annual mean maximum/minimum temperatures of 37.4/-27.4 degrees C and annual mean precipitation of 283.3 mm for the period 1953-1989. Revision Notes: Only the documentation for this data set has been modified. The data files have been checked for accuracy and are identical to those originally published in 1997. Figure 1. Termite mound at the Dzhanybek grassland site, Kazakhstan. (Prof. Roman Zlotin is demonstrating the internal structure of the mound, which has been cut open with a shovel. Photograph taken November 1987 by Dr. Yasny, Institute of Geography, USSR Academy of Sciences, Moscow). Gilmanov, T.G. 1997. NPP Grassland: Dzhanybek, Kazakhstan, 1955-1989. Data set. Available on-line [http://daac.ornl.gov] from Oak Ridge National Laboratory Distributed Active Archive Center, Oak Ridge, Tennessee, U.S.A. The Dzhanybek data set contains biomass measurements made between 1955 and 1989. Peak live biomass measurements are presented for mid May of each year 1955 to 1989 (excluding 1976) while seasonal dynamics of above-ground live biomass + dead matter are available for 1985-1989. Climate data for Dzhanybek are also available for the period 1953-1989. Data for the Dzhanybek site were originally reported [in Russian] in Gordeeva and Larin (1965); Olovyannikova (1976); Rohde (1974); Abaturov (1984); and Gilmanov and Ivaschenko (1990). Averaged over the time series, above-ground live phytomass and standing dead at Dzhanybek were estimated to be 137 g/m2 and 32 g/m2 (dry matter weight), respectively, while below-ground phytomass dry weight was 1,750 g/m2 (Table 1, Gilmanov et al., 1997). ANPP was estimated to be 201 g/m2/yr (Table 1, Gilmanov et al., 1997) which agrees with values published in Olson et al. (2013a, b) and Scurlock and Olson (2013). BNPP and TNPP were not estimated. Peak live above-ground biomass was harvested in mid May of each year from 1955 to 1989 (excluding 1976). Additional seasonal harvests of above-ground live and standing dead biomass were made at biweekly to monthly intervals from 1985 to 1989. Climate data are from 1953-1989. There are two data files in text format (.txt) with this data set; one file provides biomass estimates and the other file provides climate data. NPP Data. Biomass estimates are provided in one text file (.txt format) (Table 2). The variable values are delimited by semicolons. The first 18 lines are metadata; data records begin on line 19. Data for 1976 are missing. All biomass units are expressed in g/m2 (dry matter weight). Data on biomass dynamics and productivity were recently assembled and checked as part of a series of grassland data sets covering a wide range of climate and "continentality" (increasing maximum summer temperatures, decreasing precipitation) from the north-west to the south-east in the Commonwealth of Independent States (former USSR) (Gilmanov et al., 1997). These grasslands represent a wide environmental gradient from the luxuriant highly productive meadow-steppes of Central Russia to the ultra continental steppes of Central Asia and the arid ephemeral grasslands in the Middle-Asian republics of the former USSR. The field data from these study sites were used by Gilmanov et al. (1997) to assess grassland differences and CENTURY model robustness. The Dzhanybek site has a uniquely long and detailed time series of phytomass observations. The agreement between the field data and the CENTURY model seems satisfactory. The Dzhanybek study site is a semi-desert continental steppe on the heavy light-chestnut soils (Table 3) located across the Russia/Kazakh border from Volgograd on the Caspian Sea Lowlands. The most abundant species of the zonal ecosystem of this landscape are Agropyron desertorum, Tanacetum achilleifolium, Poa bulbosa, Festuca valesiaca, and Kochia prostrata. The total species richness of the community is high (Gordeeva and Larin, 1965; Olovyannikova, 1976; Rohde, 1974; Abaturov, 1984; Gilmanov and Ivaschenko, 1990). In a collective study of the local vegetation carried out at the Dzhanybek field station in 1950-1959, Gordeeva and Larin (1965) found 110 species of flowering plants, including 13 species of Gramineae, in the natural flora. This semidesert ecosystem is noted by its highly irregular pattern of precipitation. This data set is part of a series of grassland data sets assembled and checked by Dr. Tagir Gilmanov (Gilmanov et al., 1997) from primary sources originally reported [in Russian] in Gordeeva and Larin (1965); Olovyannikova (1976); Rohde (1974); Abaturov (1984); and Gilmanov and Ivaschenko (1990). Abaturov, B.D. 1984. Mammals as a component of ecosystems. Nauka, Moscow. 288 pp. (in Russian). Gilmanov, T.G,. and A.I. Ivaschenko.1990. Primary biological productivity of ecosystems of the alkali complex of the clay semidesert of the North Transkaspian area. Izvestia Akademii Nauk SSSR. Ser. Biol. 4: 600-611. (in Russian). Gilmanov, T.G., W.J. Parton and D.S. Ojima. 1997. Testing the CENTURY ecosystem level model on data sets from eight grassland sites in the former USSR representing a wide climatic/soil gradient. Ecological Modelling 96: 191-210. Gordeeva, T.K., and V.I. Larin. 1965. Natural vegetation of the semi-desert of the Near Caspian Lowland as the forage basis for livestock farming. Moscow-Leningrad, 160 pp. (in Russian). Nechaeva, N.T., S. Ya Prikhod'ko, and K.F. Shuravin. 1971. Net primary production for Dzhanybek (Kazakhstan) grassland site dataset. IN: Gilmanov, T.G., and A.I. Ivaschenko (ed.). Primary biological productivity of ecosystems of the alkali complex of the clay semidesert of the North Transkaspian area. Izvestia Akademii Nauk SSSR. Ser. Biol. 4: 600-611. (in Russian). Olovyannikova, I.N. 1976. Influence of the forest "kolocks" on the solonchak solonezs. Nauka, Moscow. 124 pp. (In Russian). Rohde, A.A. (ed.). 1974. Biogeocoenotical fundamentals of the exploitation of the semi-desert of the Northern Near Caspian. Nauka, Moscow. 360 pp. (In Russian). Titlyanova, A.A. 1988. Methodology and methods of studying of the production-destruction processes in herbaceous ecosystems, pp. 3-10. IN: Ilyin, V.B. (ed.). Biologicheskaya produktivnost' travyanykh ecosistem [Biological productivity of herbaceous ecosystems]. Nauka, Novosibirsk. (in Russian).